From I64/77-Take Exit 42 and follow signs for Sophia. Once in Sophia, turn right on W. Main Street (Rt. 16). Drive for 3.5 miles and Burning Rock is on your left. 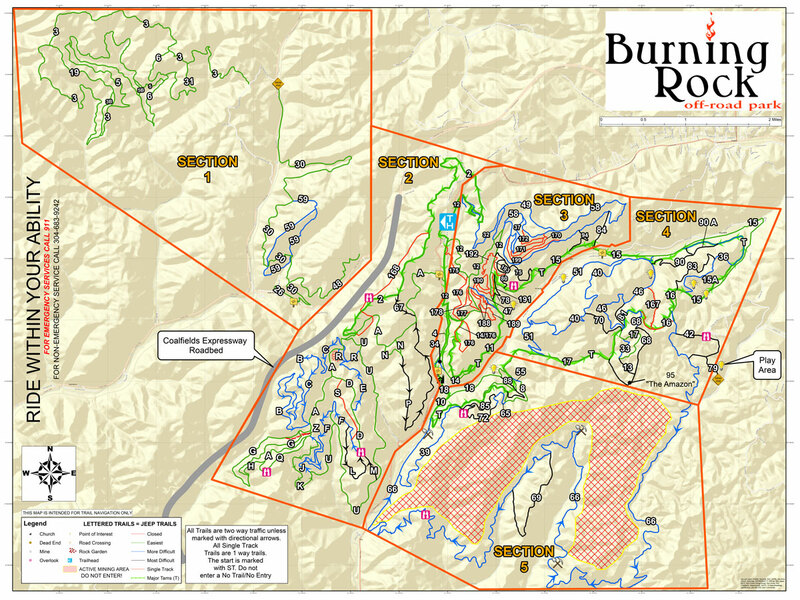 Burning Rock is a member-based facility. Everyone age 6 and up must have an annual membership which costs $20. Annual memberships are good for a full year from date of purchase. The daily fee per person age 6 to 15 is $15. The daily fee per person age 16 and up is $20. All daily fees apply whether you are a rider, driver, or a passenger. Children age 5 and younger are free, however, if they have an age-appropriate machine they may ride supervised by one or both parents in the kids’ tracks located within the Trailhead. Burning Rock also offers a Frequent Rider Pass good for 10 visits for the price of 8 visits ($160). These passes are also good for a full year from date of purchase. For a full list of permit options visit here. What are your hours and are you open all year? The store is open from 8am-5pm year round (closed Christmas Day). We do stay open until 9pm on Friday and Saturday between Memorial Day and Labor Day. The trails are also open year round. You can ride after you get your daily wristband until dusk. We do ask everyone to return to trailhead by dark. Visit here for options and prices. Are we allowed to ride ATV/SxS into the town of Sophia? Sophia allows ATV/SxS/Dirtbike traffic on McAlpin Road and the main street thru town. You are welcome to use these 2 roads to access dining and shopping. ALL other streets in city limits are off-limits. If traveling to Go-Mart (left at the light, on Rt 16) you are required to ride along the side of the road and obey all WV ATV laws. If in doubt contact Sophia City Hall at 304.683.4456. Yes. Pets are allowed on the property and we offer 2 pet friendly cabins. We do ask that dogs be kept on a leash while in common areas. If you pets enjoy wheeling they are more than welcome to ride along. In a Jeep/Truck no, however seatbelts are required as well as a roll cage and/or hard top. ATVs/SxS/Dirtbikes/Rail Buggies, yes. Engine on = Helmet on.